Oh no another doubler! Bloody Ciate again! Seriously I cannot believe how many doublers there have been!!!!!! Booooo. Here is the post for Amazing Gracie from last year, when I did a french style. This is easy to use, easy to apply and okay drying (a thin coat 3 minutes and a thick coat 7 minutes). This is really sheer. I used a thin coat at first then two thick coats. It's a pretty and delicate colour. I only swatched this so don't know how long it lasted - but judging from last year's, it lasted well. Very pretty looks. But I don't know what to say about repeating... argh! 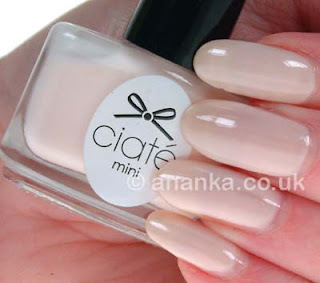 Looks as if Ciaté was trying to get rid of certain colours :o(.